Recently, in my Burbank VO2GoGo class, we talked about LinkedIn being a different kind of social network, one that is far more professional and career-oriented than other networks. You can connect with members of the pro VO community there, and on a peer-to-peer, working artist basis, rather than the more casual Twitter and Facebook. But how do you upload your VO demos there if there’s no option for audio, only PDFs and video links? It’s actually pretty easy. Here’s how. LinkedIn may not allow audio uploads, but it does allow video links. So here’s the solution: create a very simple video that uses your demo as the soundtrack, and a static title card as the image. 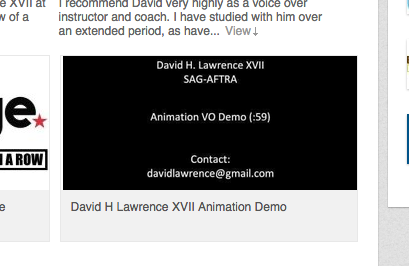 Upload that to YouTube, and then link that uploaded video to your LinkedIn profile (or any other profile you need to add demos to, but can’t upload audio to). It’s actually pretty easy. You don’t need fancy video editing software – iMovie or Windows Movie Maker, free with each operating system, will do the trick. 1. Open up your video editing software (which one will depend on your computer’s OS). I used iMovie for this example, and the instructions below are based on using iMovie. 2. Open a new HD project (movie). The dimensions should be 1280 wide by 720 high. That’s the standard HD dimensions for web video. 4. Drag that image from it’s folder onto your video’s timeline, and stretch it to make sure it can hold the entire length of the audio. 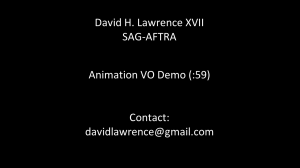 My animation demo is 59 seconds long, so I made the length of the title card a full minute, by simply dragging the edges of the clip out to 60 seconds (it starts as 4 seconds when dragged in). 6. Adjust the length of your image to match the length of your audio. A second or two overlap won’t matter. 7. Export your movie as a high quality Quicktime or AVI movie file. 8. Upload it to your YouTube account. Now, let’s see what you can do! Report back here once you’ve made your own. Bravo, David! The man of a thousand and one voices. Wow! Well done, sir, well done! Very entertaining. Thanks most of all for walking us step-by-step through the Linked In demo link process. I’ve wondered about how to do that for so long. Now we don’t have to wonder any longer. You’ve provided a great service to a lot of us VO peeps! Wow! Your voice really is amazing! 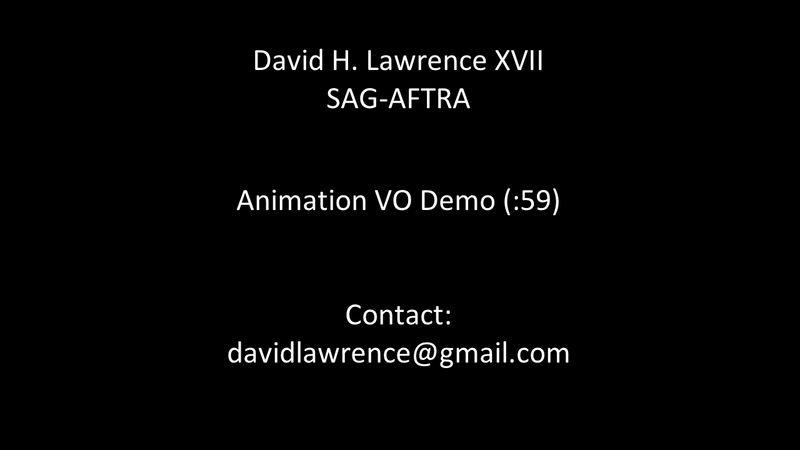 Thank you so much for sharing your voice over knowledge with all of us. It is always such a pleasure to learn new things! Thank you, David. This is quite helpful. I know what I’ll be doing this evening. . . Very clever, Mr. Bond. The idea, I mean! The demo is mindblowingly great! Best I have ever heard by far. After taking the class in Burbank I’ve being working on my social media sites and I did get the video up and running on LinkedIn. Thanks your steps made it very simple. Thank you, David. A great article and very nice to hear your diverse animation demo! Thank you, David. I was just trying to figure this out when your post came along. I appreciate your help in this area.